Does the Home Page Look Like This? Do you have the following Internet Explorer Message? You may simply accept the mesage an click the "Allow blocked content" button. But we think you need a fuller explanation of what this is all about. The reason you get this	message is that as part of our site design we have used java scriot to control the home page angel images. This error is common to all website that use java to control their menus, content etc. Scroll down until you see the Security options. 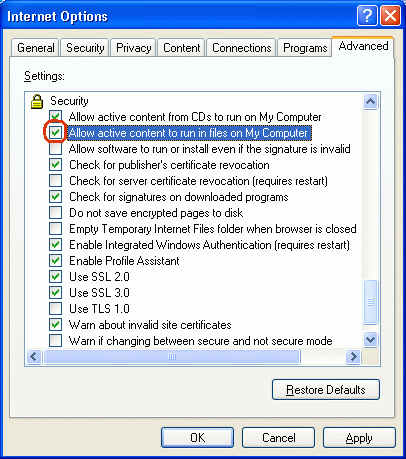 Enable the checkbox "Allow active content to run in files on My Computer". Close the dialog, and quit Internet Explorer. The changes will take effect the next time you start IE. The Blocked Content is a security feature of Windows XP Service Pack 2. If you do not have SP2 installed, then you will never see this message.